Home » A-Z Plant Index » Vegetable Garden » Amaranth – How to plant and Grow It. Amaranth – How to plant and Grow It. Amaranth is a popular vegetable (leaf amaranth) crop that is also harvested for its seed, amaranth grain. Seeds are readily available for sale online in Australia. Amaranth has been grown for 1000s of years as a food crop. It can be used in salads, cooked as you would cook spinach or in stir fried dishes and is also grown for its seeds. Plant amaranth seeds directly into rows, amaranth is a vigorous grower, plant when danger of frosts are over. 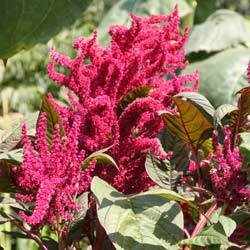 Amaranth is best picked before the seed heads mature to avoid self seeding. Seeds should be sown into a well cultivated soil. Choose a sunny position with at least 6 hours of sun a day. Sow seeds as soon as the soil warms up a little in spring. Seeds need to kept moist until germination, however not wet. One the plants put on 3 – 4 true leaves you can water well each week, if the soil begins to dry. At this stage thin plants to around 25 – 30 cm apart. Once plants are established they are reasonably drought tolerant. 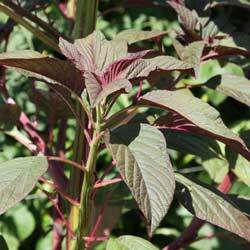 A soil rich in humus, well drained and a sunny position is best for growing amaranth. Seeds are ready to harvest when they turn black and begin to fall freely from the seed heads. Remove the flower heads at this stage and hang them in a paper bag to complete drying.